In a bowl combine the tofu, spinach and mushroom, mix and set aside. For the sauce, Heat the oil in a pot add in the onions and garlic and fry till transparent. Pour in the stared items and bring them to a boil. Lower the heat and simmer for 15 min. Remove from heat and allow it to cool. Cook the lasagne sheet as directed on the pack. 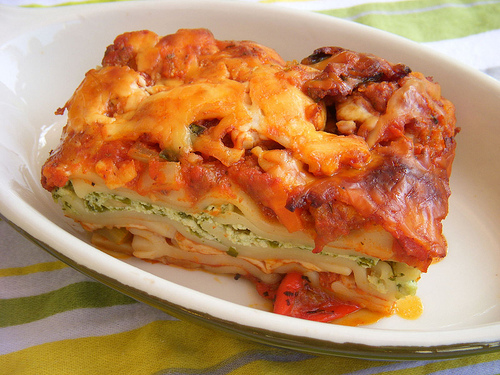 In a 12"X12" baking dish, set 4 sheets of cooked lasagne side by side at the bottom of the dish. Pour over it 1/2 the amount of tomato sauce, then top it with mix veg and a layer of white sauce and Mozzarella cheese. top this once again with 4 sheets of lasagna, tomato sauce & veg mix top this with the last layer of Lasagne sheets and pour over it the rest of the white sauce and cheese. Set your oven to 350 deg and bake for 25 min or until the top is golden in colour. Remove from the oven and allow it to cool for 5 -10 min then cut & serve. Hi ! Rabz .... Very Healthy recipe .... Great pic . Thank U . Tofu is a highly nutritious , protein - rich food that is made from the curds of Soybean milk . Rich in Phosphorus , Copper , Calcium , Iron , Selenium , Manganese nd Magnesium . It contains all the eight essential Amino acids . Tofu helps to lower bad cholesterol and reduce the risk of Heart diseases , Lowers the risk of Breast and Prostate Cancer . Helps in haemoglobin synthesis , Reduces the risk of Osteoporosis and controls Menopausal Symptoms . Despite its many health benefits , Consuming too much of Tofu or Soya product on a regular basis can have negative effects . Take Care .